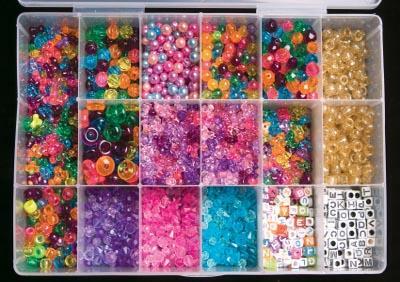 Resolve to organize your beads! Finding the right beading storage containers can make it easier to create beautiful handmade jewelry without turning your crafting area into a disaster zone. Art Bin Prism Storage Boxes: These small boxes are easy to stack and close securely. They feature plenty of compartments to keep your work neatly organized. This system is also very easy to expand as needed. Blue Moon Beads Small Magnetic Board with Containers: If you're the type of crafter who enjoys looking at her supplies throughout the day, this great product lets you attach magnetic containers filled with beads to the walls of your craft room. The Bead Buddy: This compact storage option for the beginning beader includes a complimentary bead board to make it easier to design your projects. Crop in Style Rolling Bead Organizer: This compact tote has an amazing storage capacity and is easy to move from location to location as the mood strikes. Glass baby food jars: Glass baby food jars are great for storing a variety of craft supplies, including beads. These tiny jars can be stashed on shelves or in shallow drawers. Since they're clear, it's easy to see what you have at a glance. Prescription pill bottles: Prescription pill bottles make great bead storage containers for crafters who have small children at home. The same mechanism that makes it hard for kids to get at the medicine in the bottle will help prevent your children from accidentally spilling your jewelry making materials. Altoid tins: Altoid tins aren't clear, but they can be easily painted or labeled to work as frugal storage containers for your beads. If you're exceptionally creative, you can even string rows of seed beads along the containers to create storage that's both attractive and functional. Tic tac containers: Tic tac containers are too small for large beads, but they're the perfect size for storing seed bead supplies. Plastic bags: Plastic food storage bags are a simple solution for organizing projects that you plan to take to another location. If you like to bead while you're traveling, this can be a great storage option. Ice cube trays: If you hate to open lids and you're not worried about children or pets disturbing your work, sorting beads into empty ice cube trays is a simple and cost-effective solution to your organizational problems. Color: Organizing by color is a simple choice for many crafters. This system is also the easiest to maintain. A "bead soup" made of several different types of beads that share a common color is even a great starting point for creating funky handmade bracelets and necklaces. Size: Since tiny seed beads serve a very different purpose than large focal beads, it makes sense to sort your beads into categories in this manner. Type: If you like to make jewelry with several different types of beads, you may want to sort your supplies into categories such as glass beads, lampwork beads, or swarvoski crystals. Project: If you frequently purchase kits or beads that are intended for specific projects, it may be easiest to simply keep the supplies for each finished item together. Manufacturer: While this isn't a very common organizational option, crafters who are loyal to one or two manufacturers may find this works well for their needs.